and received a promotional item to thank me for my participation. As an avid coffee drinker I have tried many coffees, many claim to be the "best" or "greatest" coffee. What they don't claim is being able to brew a cup of coffee in a minute or less, or being made with only high quality ingredients! 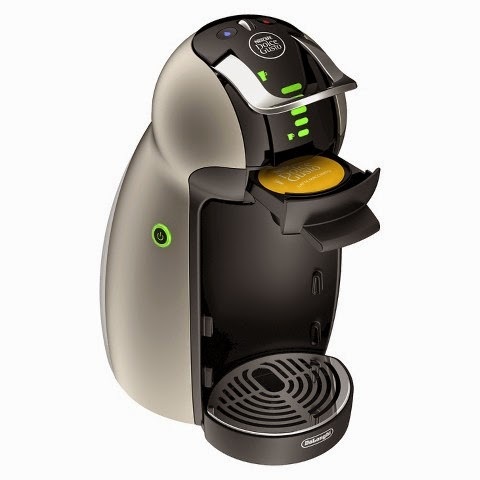 The NESCAFÉ Dolce Gusto does both of those and brews 19 different hot AND cold beverages. You can have your hot cappuccino in the morning and an iced cappuccino in the afternoon, from the same machine! I was fortunate to receive a NESCAFÉ Dolce Gusto Genio machine and I love it. The Genio is so easy to use with little to no clean up other than throwing away the capsules needed to make the greatest cup of coffee! I love the ability to decide the strength, temperature and size of my coffee all in one machine. 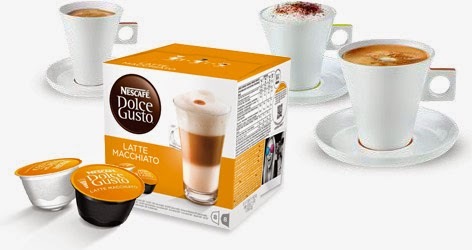 The NESCAFÉ Dolce Gusto really does prepare your drink of choice in a minute or less. The Genio, pictured above, makes 3 cups with a 21 ounce reservoir that easily fills and slides on the back. Making your drink is so effortless, just add your drink capsule and make your own paradise in a cup. Every capsule is airtight making sure they are fresh each and every time. The coffee beans used are grown on NESCAFÉ farms, roasted to perfection and then finely ground to each specific drink. I was surprised to learn that the coffee capsules are good for up to a year! For the milk-based drinks there is a 2 capsule system, using a separate milk capsule that are filled with natural whole or skim milk that is preservative and hormone free. Okay, so I admit I am not the best at making videos, but I had to share with you all how easy it is to brew a cup of Dolce Gusto coffee. I forgot to mention that the NESCAFÉ Dolce Gusto is designed with a professional 15-bar pressure system, that works by very quickly dispensing the water evenly over the grinds creating a bold, full flavor. I personally LOVE the Morning Blend/Light Roast, every cup is heavenly! My family is enjoying the Dolce Gusto Genio as well, my husband is a bold, dark roast kind of guy, and my kids are thrilled to be able to make their own iced cappuccinos. The next flavors to try are Caramel Latte Macchiato, Chai Tea Latte and the Latte Macchiato (below). I just have to share that the NESCAFÉ Dolce Gusto Genio is a recipient of the 2014 Consumer Reports Award and the 2014 Gold Edison Award. 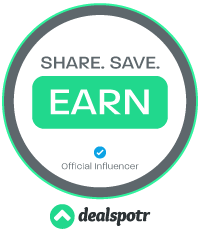 You can get your own award winning NESCAFÉ Dolce Gusto at select California Target locations, on the Target website, and select California Costco locations.